The trombone is a member of the brass family. As with all brass instruments, the sound is produced by buzzing the lips into a mouthpiece. A unique feature of the trombone is the slide. While other brass instrument change pitches by pressing valves to change the length of the air flow, the trombone player simply moves the slide in and out to the change the length of the instrument. Students who play the trombone should have a good ear and be able to sing in tune. Students who have an ability to match pitches will know when the slide is slightly too far in or out. But other than that, its a relatively easy instrument to start with. Taking care of a trombone is slightly more difficult than the other brass instruments. The slide of a trombone is very delicate. If the slide is dented or bent at all, it becomes an unplayable instrument. The trombone is stored in the case in just two pieces. The only regular maintenance required is to clean and oil the slide now and then and grease the tuning slide (it rests behind the players head) as needed. The trombone is played with the bell on the left side of the slide. The slide is held in the right hand and the bell portion is held with the left. Some trombones include an F attachment with a trigger or a valve for the left hand. These instruments are not typically for beginners. Almost all trombones come in just one size. Several have the optional F attachment but the instrument plays in the same way as a trombone without an F attachment. The F trigger just allows a player more alternate slide positions for difficult passages. Students can start to benefit from a trombone with an F attachment as early as their second or third year of band. But even many advanced players prefer trombones without the attachment. Other sizes of trombones are strictly for advanced players. They include the bass trombone and the alto trombone. The trombone is not nearly as popular as the trumpet or clarinet. Less students performing an instrument means that the competition will not be as fierce. Good trombone players are considered very valuable assets by band teachers since there are so few of them. The trombone is considered one of the most widely used instruments. We can hear trombones in bands, symphony orchestras, jazz groups, brass quintets and as solo instruments. 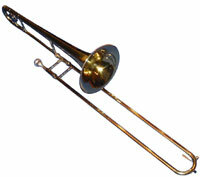 There are several good choices for purchasing a beginning trombone. Three standard beginning trombones that sell through Giardinelli include the Blessing B-128, the Getzen 351 or a slightly more advanced trombone, the Blessing B-8 Artist. Purchasing a used trombone can be a good option if it is purchased with some caution. There isnt a lot that can go wrong with a trombone compared to a woodwind instrument. If the slide moves freely and the instrument doesnt have leaks or large dents, it is probably a decent instrument unless its manufactured by a substandard brand. Buying a used instrument is only recommended if you know an advanced trombone player or band director who can test the used instrument before you buy.